When your dog has fleas, they can be a real nuisance. Not only is your dog itchy, but these pests can cause a variety of diseases. When I adopted a dog with fleas, I did all I could to help get rid of these pesky bugs. How to get rid of fleas on dogs? The most reliable method of getting rid of fleas on your dog is to use a flea preventative. There are topical products and oral products available in pet stores, on-line, and through your veterinarian. You can also try home remedies like bathing and grooming your dog to help get rid of fleas. The #1 Top-Selling & Top Vet-Recommended Topical Flea Product on the Market. 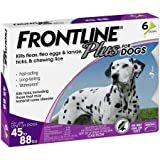 There probably isn’t a more talked about flea and tick medication than Frontline Plus and for good reason. Avoid monthly treatments with 8 straight months of flea prevention! Highly recommended by vets and contains an insecticide that is grease-free and odorless. Not only does it repel fleas and ticks but also larvae and lice so your dog will be completely protected with this collar against most outside intruders. What are fleas on dogs? Can my dog get fleas if he stays inside? Do I have a flea problem? You’ll find that there are a variety of flea prevention products. Topical products include Frontline and Advantage, while oral products also exist. These oral flea preventions tend to be faster acting and avoid the topical mess that can occur when you apply a product to your dog’s long fur coat, but they can have more side effects. Only about 5% of the fleas in the environment are adults; the rest are microscopic eggs, larva, and pupae. Adult fleas tend to live on your pet, and they lay eggs that fall into the environment, which can be your yard, your carpet, and even your bed. The eggs then develop into adult fleas, perpetuating the cycle over again. 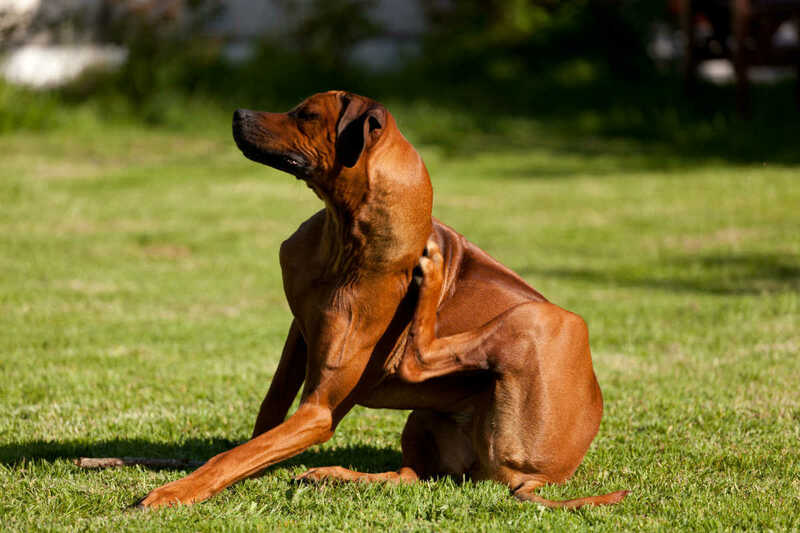 Fleas can cause intense itching. They are a common cause of itchiness and hair loss in dogs and cats. Fleas can also transmit diseases and cause health complications such as anemia, which has the potential to be deadly. Preventing fleas before they become a problem is important to your dog’s health and even your sanity. This is probably one of the most asked questions when it comes to talking about fleas (and ticks). The fact is, fleas, just like mosquitoes and flies, can find an entrance into your home before you even realize it. Your dog doesn’t even need to go outside to wind up with fleas camping out in his fur. Since fleas are highly attracted to warm bodies, your dog is an immediate target once he goes outside. But they don’t have to catch a ride on your dog’s back to get in, as they can get a ride in on your own shoelaces or pants legs as well. Just one or two fleas in your house can quickly turn into a problem for you and your dog, as they multiply quickly. Once that happens, getting rid of them can be a chore. They lay eggs very often, and eggs hatch about every two weeks. This means that you can completely rid your home and your dog of fleas, and inside two weeks time, you have another infestation. How Can I Tell If I Have a Real Flea Problem? To be honest, if your dog resides primarily inside your home and has one flea, you have a problem! That one flea will without a doubt, turn into many, many more and the earlier you catch it, the sooner you can do something to stop it. A sure sign that your dog has fleas is the excessive scratching that is sure to happen. Upon examining the fur closely, you may even be able to see the insects moving around on the surface of the skin, reddened skin and even some loose hairs due to scratching. This would be a good indicator that you need to speak with your vet about what kinds of products you might want to look into for your dog. The mainstay of flea prevention for years has been topical prevention products. These are insecticides or pesticides that kill the fleas and often their eggs. A variety of these products are on the market, and you’ve probably seen them on the shelves. Some examples are Advantix and Frontline Plus. Many of these products also provide protection against ticks, which makes them especially beneficial in some areas. You typically apply the product to your dog’s neck or back, and you’ll want to be careful not to wash the product off once you’ve applied it. It is the #1 top selling and top vet recommended flea and tick product on the market. This topical prevention method is to be administered on a monthly basis and kills fleas and ticks within 48 hours of application. One of the main ingredients in Frontline Plus is S-methoprene, an insect growth regulator that kills both flea eggs as well as larvae. It is a highly effective method for treating for brown ticks, American dog ticks and deer ticks, the three biggest carriers of Lyme disease. Lyme disease occurs most frequently in New England and even vets will suggest that residents have their animals vaccinated as well as using a flea remedy. However, those who live in that vicinity and use Frontline Plus attest to the fact that they do not have fleas on their dogs when they use Frontline. One lady recently visited her mother, who has a poodle that cannot receive flea remedies because of an epilepsy diagnosis. Her mother’s poodle had many fleas, but during the daughter’s two-day stay there, her own dog never picked up a single flea or tick. Another flea and tick medication that has become a household name is Bayer K9 Advantix II. This medication is very similar to Frontline and is administered in much the same way and on a monthly basis. K9 not only repels and kills fleas and ticks but also mosquitoes, biting flies and lice. Used every month, this medication prevents flea and tick infestations and last for up to four weeks, even preventing the infestation of your home. Try to administer the first dose before flea season starts, so you don’t have to worry about trying to get rid of them once they are on your dog, while treating year-round will assure that fleas don’t attempt to spend the winter months inside your home where it’s nice and cozy for them. The major complaint I have with K9 Advantix is that the expiration date is not readily available. Not only is it listed in code on the product itself, but customer service will quickly tell you that the EPA does not require an expiration date on these types of products. While an expired flea and tick medication doesn’t mean that it will become dangerous, it does mean that the effectiveness of the product will falter over time and not be nearly as effective at getting rid of these pests. Another form of topical prevention are flea collars. While some of these tend to be reliable, such as the Seresto collar, which lasts for up to eight months, others are much less effective. These can be no better than putting water on your dog or even have harmful effects, especially to the people that come into contact with them. 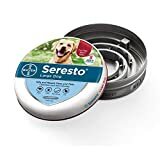 The Bayer Seresto Flea and Tick Collar will protect your dog for up to eight full months, is highly recommended by vets and contains an insecticide that is grease-free and odorless. The Seresto collar is water resistant and is still effective through monthly bathing and swimming, however, if your dog swims more than once a month, the protection period is reduced from eight months to five. In addition to being a great collar for keeping fleas and ticks at bay, it features a release mechanism should your dog become trapped by the collar in some way. The dog’s weight will trigger a quick release so that no harm comes to him. You may have tried some of the more expensive brands in the past, only to be disappointed by their performance. Don’t let the lower price of the Seresto fool you, as it has been known to outdo the competition by leaps and bounds. There have been plenty of dog owners who have switched to this collar, for varying reasons, only to find it works much better than their regular expensive ones. This collar might also leave you wishing you could wear them yourself. A lady from New England, where fleas and ticks are a big problem, recently reported that her father took her dogs hiking and when they returned, her father had ticks on him but the dogs did not! Oral flea prevention products have become increasingly common in recent years. They tend to have very little mess – unless you have a dog that doesn’t like to take pills. Some products only provide protection against fleas, while others are also a tick preventative. Trifexis, one product on the market, is also a heartworm prevention in addition to being a flea prevention product. In addition to causing less mess, they are typically faster acting. What may take a topical 12 hours to do, an oral prevention can often do in one. You don’t have to worry about oral preventions getting washed off. These products, such as Simparica and Comfortis, remain inside your dog. Many are contraindicated in pets that have seizures. These dogs may be more likely to have a seizure after taking the oral medication as opposed to a topical. Some are also not labeled to be used in puppies, so you’ll have to use something else in your young dog. Finally, if your dog has a reaction to one of these products, you can’t just wash it off and have the symptoms go away. When your dog has fleas, grooming is very important. You can actually use a flea comb to brush the fleas off of your dog, but this is more effective if you get rid of many of the fleas first. Let’s see what you can do to get rid of fleas on your pup. The first usual step in flea prevention is bathing your dog. Work up a good lather to help get rid of as many of the fleas as you can. You can use a flea shampoo, but these sometimes dry out your dog’s coat. As an alternative, many people recommend using Dawn dish detergent as a shampoo when your dog has fleas. After you have bathed your dog, you may want to use an apple cider vinegar rinse for your dog. Mix equal parts vinegar and water. This creates an acidic environment that fleas don’t find favorable. Be careful to avoid your dog’s eyes. You can also add some apple cider vinegar to your dog’s food to help make them unappealing to fleas. Once you have bathed your pup, make sure to brush out their coat thoroughly. This will help get rid of live and dead fleas that are in the coat. Brushing out any tangles helps make sure that fleas don’t have anywhere to hide on your dog. Another important facet to getting rid of fleas on your dog is getting rid of fleas that might be in your environment. In extreme cases, you may have to call an exterminator, but there are often many things you can do before it gets to this point. Wash all bedding that your dog lays on, as well as any fabric-based items that they may come into contact with. If you can put the items, such as dog beds, into the dryer – do it. This will help kill fleas and their eggs that may be on the bedding. Vacuum the floors of your house, even the hardwood floors, if you can. This will help get rid of flea eggs that have fallen off of your dog and into the surrounding floors. Get rid of the vacuum bag once you’ve used it to ensure the fleas don’t hatch back into your house. If you have access to a steam cleaner, use it on areas such as the floors and furniture. If you don’t have one, make sure to vacuum off the couch when you’re taking care of the floors. This is one more step to help get rid of the fleas in your house. Some people swear by using diatomaceous earth to help get rid of fleas. You can spread this on your carpets and leave it for about 48 hours. You can also use baking soda to help dry out flea eggs in the ground. Vacuum up whatever you put down well and make sure that your dog doesn’t get into it. My own dog is half Siberian Husky and half German Shepherd and was born outside. When we got her, shortly after she was weaned, she had a bad flea problem. It had gotten so bad that her skin was raw and bloody and some of her hair had come out. I was determined to get rid of those fleas. I started out with the flea shampoo. Of course, everyone said it wouldn’t work and sure enough, it didn’t. I used an entire bottle in a relatively short period of time and while a few of the fleas would die and wash off, the very next day they would come back with a vengeance. This process continued with several more products. I tried pills, drops on the back of the neck, special wipe-on products and flea collars, all to no avail. Finally, I decided to speak with a friend of mine who works with a local vet and she told me that fleas had been a major problem for every dog owner she knew. They had been overrun with appointments for dogs that were infested with fleas, all with the same story as mine: they had tried everything, and nothing worked. Her secret? Well, since she gave it to me free of charge, I’ll pass it on the same way! Buy the small bottle of blue Dawn dish liquid. Apparently, no other color or brand of dish soap will do, as they had tried cheaper alternatives and none of them worked. Run a nice warm bath and add a cup of bleach and a couple cups of oatmeal and then proceed to use the entire bottle of soap. Keep scrubbing for at least 15 minutes, as anything less doesn’t work as well. My vet laughed and said she knew that it sounded overboard, but it was truly the only thing that had worked for any of the dogs she had treated. I tried it, and I have to say, you must be prepared to rinse and rinse and then rinse some more, but it worked! I can’t tell you how thrilled I was to see my dog finally free of these blood-letting pests. I repeated this only a couple of times over the course of the last year and she’s doing fine now. What is the best flea treatment for dogs? There are a number of factors involved in determining what treatment is best for your dog. Make sure to discuss it with your vet. Oral combination products, such as Trifexis, tend to be effective for fleas as well as internal parasites. Does coconut oil kill fleas on dogs? Coconut oil can kill fleas on dogs. This is due to a component in the oil called lauric acid. While many people use this product, it should be used with caution in dogs. Some pets have developed pancreatitis after ingesting coconut oil added to their food or applied to their coats.